Whether you’re hosting a large group assembly or a small group session, any of my presentations will include something from the list below. Keep in mind that the poems, activities, and talking points may overlap from presentation to presentation. Elementary School assemblies and Family Shows generally do not require a projector and screen. But Middle, High, and Adult presentations generally DO require a projector and screen. Recognizing Character, Action, Setting, and Theme within a poem. Allan Wolf enjoys visiting with schools, classes, book clubs, and other groups (whether or not they have read his books). A day of Author Visits can be generally informal although it may include more formalized presentations as well. Wolf will share the story of how he came to write one or more of his books. 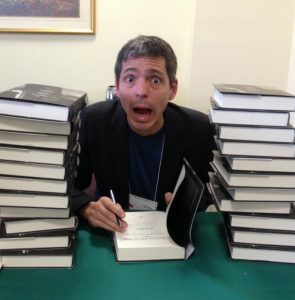 He will describe his writing process, answer questions, and sign books. Some of his titles have accompanying Curriculum Guides with study questions, suggested activities, plus information and secrets behind the making of the books. Mr. Wolf’s books are available anywhere books are sold. You can purchase them directly from the distributor at a 40% discount for resale. Immersed In Verse: Allan Wolf's Poetry Palooza! Whatever the grade-level or occasion, the main objective of this presentation is to get your audience jazzed about poetry and the power of words. Allan Wolf, an award-winning poet and master presenter, performs poetry from memory, mixing theatre, music, and audience participation. Students will experience contemporary and classic poetry in a wide variety of styles and subjects. With nearly a thousand poems committed to memory, Wolf is able to tailor his content and approach to suit nearly any audience and any occasion. Perfect for kicking off a poetry unit or to celebrate National Poetry Month. 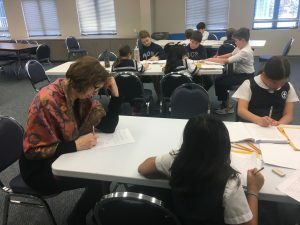 Wolf gives students an opportunity to meet a real working author while learning how we transform words into poetry and how poems transform the ordinary into the extraordinary. Award-winning author and performance poet, Allan Wolf, demonstrates how he transforms historical fact into historical fiction. Experience the 1912 voyage of the doomed Titanic through poetry, storytelling, costume pieces, and historical photos as Wolf presents a special interactive author talk based on his multi-voice novel, The Watch that Ends the Night: Voices from the Titanic. With a 5′ long Titanic model “puppet,” Wolf demonstrates how the ship was constructed, struck ice, broke in half & then sank. He addresses Titanic myths and facts. 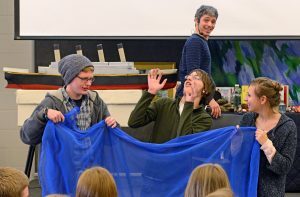 He brings some of the Titanic’s passengers to life: the ship’s designer, the ship’s owner, the captain, a 9-year-old boy, the “unsinkable” Molly Brown, even the iceberg itself! The Watch that Ends the Night was named the North Carolina Young Adult Book of the Year by the North Carolina School Library Media Association. Booklist named Watch one of The Fifty Best YA Books of All Time. Metaphors Be With You: Poems From Space! New for 2019! To coincide with the 50th anniversary of the lunar landing! A new presentation by performance poet Allan Wolf that is one part facts and three parts fun! A multi-media presentation for third through sixth grade. Featuring puppets, power point slides, music, and, of course, Allan Wolf’s engaging award-winning poetry. An interactive out-of-this-world introduction to our solar system and beyond. Wolf brings each planet to life with its own memorable personality. Saturn is a fashionista. Jupiter is a bodybuilder. Neptune sings the blues. Pluto and its moon, Charon, dance like Fred Astaire and Ginger Rogers. Elderly rockets reminisce at the Rusty Rockets Retirement home. Members of the audience become robots that rule the world. 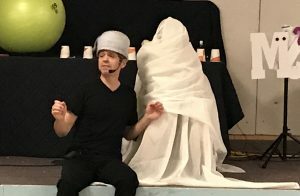 This presentation is based on Allan’s new book (Available April, 2019) titled The Day the Universe Exploded My Head: Poems to Take You Into Space and Back Again (Candlewick Press). Writing Workshops: Fun intro, mentor texts, a writing prompt, group modeling, individual writing, and sharing. Poetry Performance Workshops: Fun intro, mentor text, CAST (Character, Action, Setting, and Topic/Theme), basic stage technique (voice, posture, stage position), scripting (dividing lines into speaking parts), large group modeling, STARS (Set, Title, Action, Receive applause, Strike), small group rehearsal, and sharing. Follow-up Classroom Visit: A chance to “meet the author.” Informal and fun. We will do whatever seems appropriate at the time. 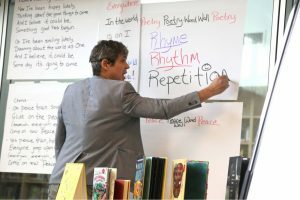 Teacher Workshops: Putting poetry to work in the classroom. Best practices. Specific topics will vary based on need. Keynote Talks: Love them. These may require additional prep in order to fit the needs of each occasion. I am available for “residencies” for 2-5 days at one or more schools. I still like to cap my number of presentations at four/day. A residency can consist of: 1) A progressive sequence of linked presentations with a repeat audience, 2) A series of unconnected presentations with different audiences, or 3) Some combination.